With worker concerns about how automation and artificial intelligence will reshape our economy on the rise, a bill before congress combined with pressure from the White House could provide some relief. The bill, which aims to expand Pell Grant eligibility to include certain short-term job training programs, mirrors language used in the 2020 presidential budget. As part of his budget mission statement, Trump highlighted a commitment to “investing in America’s students and workers,” and listed Pell Grants as one of two key ways he planned to realize this goal. Under current law, Pell Grants, a form of federal financial aid, are awarded to low-income students in programs that take more than 600 hours or at least 15 weeks to complete, typically undergraduate students pursuing a bachelor’s degree. The grants, which can total $6,095 for the 2018-2019 school year and $6,195 for the 2019-2020 school year, typically do not need to be repaid, unlike most other common forms of student financial aid. The JOBS Act would alter this standard by allowing students undertaking shorter job training programs at a higher education institution, such as a community or technical college, to also qualify for such funding. To be eligible, a person must enroll in a program that has at least 150 hours of instruction time over a period of eight weeks, leads to industry-recognized credentials and certificates, and meets the needs of the regional or local workforce. Because of the shorter nature of such skills training, the highest amount these students could receive in Pell Grant funding would be half the current maximum awarded to traditional recipients, or about $3,047 for the 2018-2019 school year and $3,097 for the 2019-2020 school year. The National Skills Coalition, which has endorsed the legislation previously, estimates that between now and 2022 almost half of all open positions will be “middle-skill” jobs, meaning they require education beyond high school but not a four-year degree. For instance, under the JOBS act, students could get assistance paying for programs like the Des Moines Community College’s Commercial Vehicle Operator Training course, or the North Baton Rouge Industrial Training Initiative, offered through Baton Rouge Community College, which teaches welding, electrical trades, or pipefitting. Each of those classes could help people land a job in a growing industry with decent wages. The Bureau of Labor Statistics expects tractor-trailer truck drivers will see a 6 percent surge in hiring through 2026 and median pay of $42,480 annually. 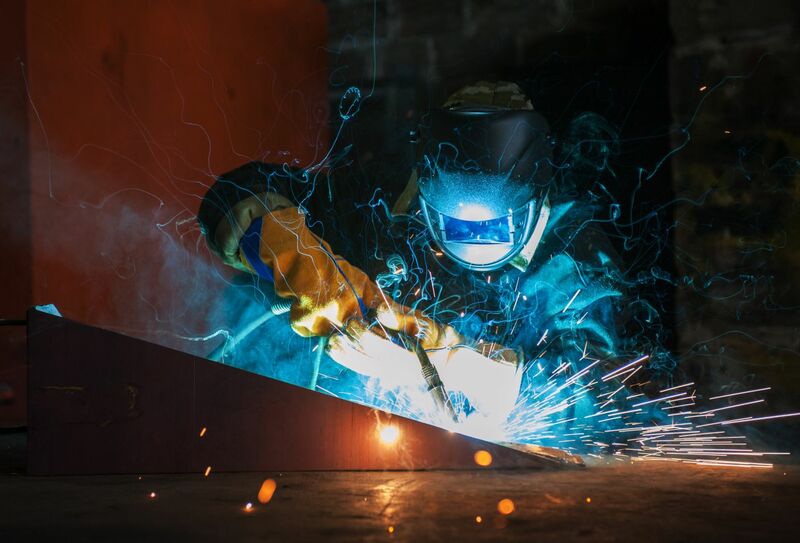 The welding trade will hire 6 percent more workers at a median salary of $40,240. Electricians will see a 9 percent uptick in hiring and receive a median wage of $54,110. And finally, pipefitters are in big demand, with hiring expected to grow by 16 percent, and a median income of $52,590. Not only does the JOBS Act have rare bi-partisan support in Congress, but its content appears widely popular among voters, according to a new survey conducted by ALG Research, on behalf of the National Skills Coalition. Of 1,000 likely 2020 general election voters, the survey found that 93 percent support increasing investment in skills and technical training. That support continued even when it was noted that the increased “investment” would come from government funding. Overall, 85 percent of voters agreed with the idea, including 90 percent of Democrats, 82 percent of Independents and 80 percent of Republicans. 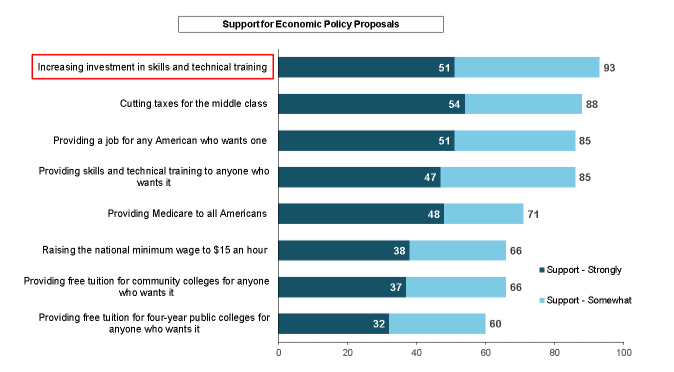 Skills training legislation was also more universally appealing than seven other economic proposals the survey queried people on, beating policy ideas such as cutting taxes for the middle class (88 percent support), providing Medicare to all Americans (71 percent), raising the minimum wage to $15 (66 percent) and free tuition for four-year public colleges (60 percent). Voters said they would be more likely to mark a ballot for a candidate who supports increasing government funding for skills training, regardless of political party, by a 50-percentage point margin. Those findings dovetail with results from a separate survey from Phi Delta Kappa, a professional association for educators, that has been running polls about Americans attitudes toward education for almost 50 years. In 2018, they found that less than half of people believe public education’s main goal should be to prepare students academically, instead 82 percent wanted more job and career skills classes, even if it meant less time for traditional academic subjects.